Yesterday it worked. But now it does not work any more. Everything (bpmn- und java-file) is unchanged and from the example in the sample folder. Please help me to get it running again. so I am clueless why the process instance viewer fails. Now I deleted everything and run the installer again. This time the process is displayed without error. What can this be? How can I prevent errors like this? In a production environment (my plan is to set one up) I cannot delete everything in case something is not working. Please help me finding the mistake I made. We encounter the exact same issue... As Michael pointed out, having such behavior in a production environment isn't going to work. Does anybody have more details on what's happening or how to fix this problem without deleting everything? What's the problem exactly? the IDE? or the runtime? Because the runtime works perfectly.. I've just updated my name, didn't realize I had that messed up . I believe it's the IDE (plugin) because when I look at the "Process Instances" view, I can see 1 RuleFlowProcessInstance. However, when I double click on it to see its details in the "Process Instance" view, I get the above mentioned exception saying "Could not find process instance with id com.sample.evaluation". yes that could be it. Which version of the plugins and the runtime are you using? I use jBPM version 5.1-Final and used the ant script from the installer to configure Eclipse and the plugins. thanks for your help. I am using "jbpm-5.1.0.Final-installer-full.zip"
By the way: is there a manual/tutorial for setting up eclipse just like you? I mean: just like somebody working on the jbpm project? If I could do this I could probably debug such problems for my own and help some other newbies here, possibly finding bugs and provide patches. I am willing to invest time and I am a good java programmer. I really need help. 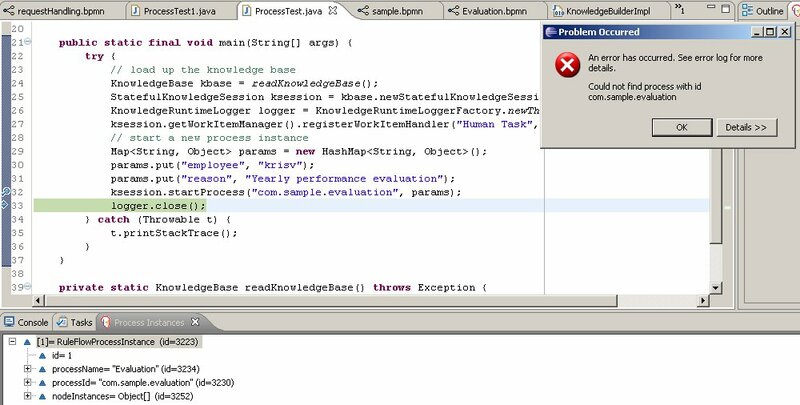 I cannot see the process instance in eclipse. The only way is to re-install everything from the beginning. Is this some kind of cache problem? Why is the process instance viewer not able to select the process which is obviously in the knowledge base? @Mike: Were you able to solve the issue? Im also experiencing the same issue..... did you resolve it? Your assistance is a greatly appreciated..
Michael, I got pulled into another project and haven't had any chance to look into that in more detail. I've chatted with the jBPM guys in their IRC channel (http://irc.codehaus.org/, then select #jbpm in the channel dropdown), but still couldn't solve that problem. I only got a small step further and finally managed to connect everything to my mysql database, although that raised a bunch of other issues. I also need a solution to that pretty soon as the current project is supposed to take advantage of jBPM too... Honestly, I've started looking into Activiti (http://www.activiti.org/) as an alternative if there are more obstacles with jBPM. I have the same issue with jBPM 5.2.0. Any solution to this?